Each year during Janmashtami I put my culinary skills to maximum use for the celebrations. My son is doing a fantastic job of keeping me awake at night and this year I had the energy and time for just one treat. People, do send in your prayers for his sleep cycle to change. 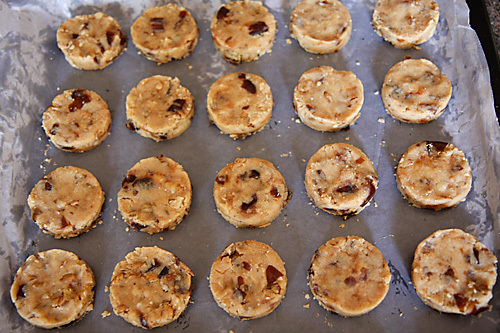 Since I love fruit and nut combinations and especially a cake made with date and walnuts, I wondered if the same combination could be used to make cookies. 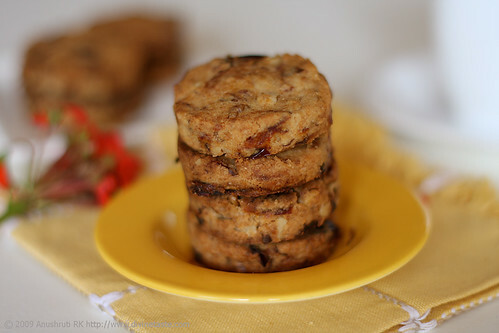 A Google search revealed that there were many others who had already thought on similar lines and I was quite surprised to find many recipes for date and walnut cookies. This one caught my fancy and I made a few variations to make my version of date and walnut cookies. A great afternoon snack packed with the goodness of whole ingredients, I’m thrilled to have this recipe in my kitty. I would any day munch into a cookie made at home than dig into something that is store bought and factory manufactured stuffed with energy depriving emulsifiers and preservatives. Everyone who tasted this cookie absolutely adored them and these cookies have won me rave reviews. Mellow, soft, sweet and nutrient dense dates with crunchy, health friendly walnuts find residence amidst whole wheat goodness in this recipe. If these make way into your cookie jar, its quite nice to satisfy those mini hunger pangs that haunt most of us in-between large meals. This would also look nice and healthy in a child's tiffin box. The butter can be substituted with vegan butter for a vegan version! Sieve the flour, baking powder and baking soda together once. 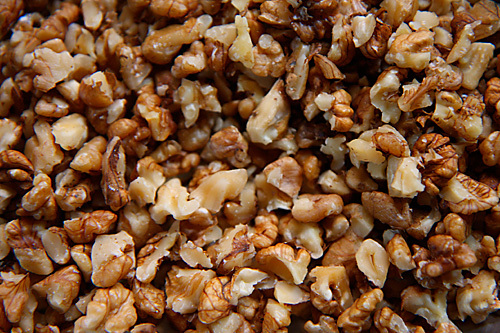 Mix in the chopped dates and walnuts. Stir in the sugar into the melted butter when the butter is hot. After the butter reaches room temperature or cools down, stir in the flour mixture. Mix the ingredients together until well combined. Make balls with your hands and flatten the balls with your palm. Alternatively use a cookie cutter to get even sized cookies. Bake at 180 degree centigrade (350 degree F or gas mark 4) in a preheated oven for about 20 minutes or until golden brown. Same here sleepless nights with my 2months old daughter….praying for her cycle change 🙂 Dates and wallnut yum combo…luved the first pic! Wonderful cookies Shruti.. Looks soo delicious.. perfect presentation. Cookies have come out lovely! I will most definitely pray that your kiddo doesn't keep you up. I'm guessing that's why the late night tweetning, huh? I've had a date and walnut cake on my to-bake list since forever! Something or the other always ends up looking more delicious. These look scrumptious….I am drooling!!! The best part is that I like the fact that there is no use of maida/all purpose flour and you have used whole wheat instead. It makes the cookies so much healthier. hope your baby is less than 6 months old. my 7th month, you can change the sleep pattern! Love the combo in Cookies! Lavi: My son is 5 1/2 months old. Thank you for the award, very sweet of you. Try different timings for giving bath,feeding baby, and once you start solid's, your little son can sleep at a stretch for 7hrs. For Vadai..I learned to prepare perfect vadai's from here. I am certainly praying for you!! Sharmilee: Thanks. That's indeed nice of you. binam: I'm glad you liked these cookies and happy that they came out well. Thank you for reporting back. Wow the cookies have come out perfect. It looks tempting. Here for the first time and absolutely in love with your site. Looks so neat and nice with brilliant pics for the recipes. You have a lovely collection of recipes here. Great going. Will be here often. Your participation would make us more than happy. I tried a similar version from a book, were the cookies crispy or chewy? Also the wheat flour mentioned is atta or pastry flour? Sharmilee: They were a combination of both crispy and chewy. The flour used is simple whole wheat flour or atta which is easily available. Pastry flour is not easily available. Hi Anushruti: Should I be using salted butter or plain? I used salted butter and ended up with salty tasting cookies. Since there was sugar, plus the dates, it dint quite taste as good with the salt element. Ashwini: I used unsalted butter here. Many prefer a tinge of the salt taste to sweet biscuits, so actually its a personal preference to use unsalted or salted butter. Unsalted butter is fresher and allows only the sweet taste to come through, but I also add a pinch of salt at times. If unsalted butter is hard for you to find then you can think of using ghee. I am in love with your site. Could you tell me if i could subsistute other nuts – like almond or peanuts which are readily available in India than walnuts? cathy: Thanks. Walnuts are easily available in India too…but you could of course use almonds or peanuts which work well too. Peanuts, also known as the poor man's almonds are nutritious and widely available too. Hi, the cookies are tempting indeed ! Please cud you share how many cups wud be 225gm of the whole wheat flour? Thanks ! Nice recipe! Can you please tell me when do you have to add baking powder and baking soda and when not while baking cookies? I was confused because your other cookie recipes do not require them. And which butter is to be used? Salted or unsalted? And where do you get unsalted butter in Mumbai? Saumya: 225 gm is 1 1/2 cups flour packed. Riddhi: Each recipe is different This one uses both. Read the recipe carefully to understand when to add baking powder and soda. Loved your recipe, have planned to try it for sure but before I do so, wanted to check with you if we could reduce the amount baking powder/baking soda or substitute them. The thing is my 18 month old prefers taking cookies rather than the normal food and I usually try to avoid giving her items with the same. Tanu: You can reduce the same. Your cookies may not rise or expand but they would still taste good. You can try using aluminium free baking powder which is not harmful. Hi, this baking soda.. I am always confused about.. Do u get in it any branded packet or just the loose one with the local grocer.. Is it the same as what is called 'Khane ka soda' ? Also the aluminium free baking powder, which brand does it come in please…For even I was cooking for my 2.5 yr old. … N then if I m using the aluminium free baking powder, can the baking soda be skipped completely. Tried this receipe. Infact this is the first eggless recipe I am baing. The cookies really did taste good. 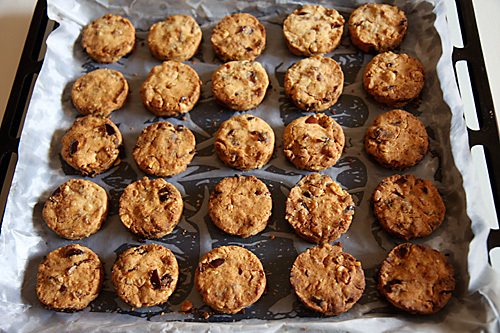 But I felt that the cookies lacked the chewy taste and that binding which we get when the cookies are made with egg. Anything else to be added? Or do you think I went wrong somewhere? Taruna: You can use khane ka soda or meetha soda as it is baking soda itself. Blue bird baking powder is aluminium free. Anagha: Different cookies have different textures. This cookie tasted just right to us when I made it. At times, flour has different water absorbing capacities. You could use a few spoons of milk as binding if you feel the mixture is dry. 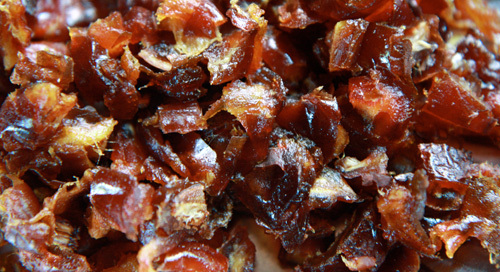 Or maybe you would like to try a different recipe for that chewy texture? Very beautiful website and very well presented. Mamta: That's great to know! Thank you for the feedback. tried these cookies.. turned out pretty good.. these are the first cookies that i've baked in my life.. was happy they tated nice. thnx for the reciepe.. cant wait to try the recipies too. supriya: I'm so happy tp know that these were the first cookies you tried and that they came out well. Look forward to hearing more from you. I just made these cookies and they taste wonderful! Thank you so very much for this amazing recipe. I just have one question, how long can I keep them? Should I put them in the fridge? Thank you again! Alexis-Thank you for the feedback! You can keep these cookies for upto 3 weeks and there is no need to refrigerate them. 1. What is the flour quantity if we measure in cup? 2. do we need to preheat the oven? Shreya- Thanks for the query. The recipe has been updated. Laya- Thank you for the feedback. Hamsini- You are welcome. Glad to know you liked this recipe.